Where did Lent go? On one hand, this might have felt like the longest couple of months ever, but on the other, I'm not sure where all of the time I had set aside for my Lenten resolutions has gone. We find ourselves nearing Palm Sunday, and fortunately for those of us who feel like our Lent slipped away, the Church has a built in retreat coming up in the form of Holy Week. Holy Week gifts us the opportunity to enter into the most beautiful and profound liturgies, and also naturally sets us up with a little more silence and contemplation. I know that my schedule looks different, and one of the things I hope to do is to spend some time reading good, formative books. 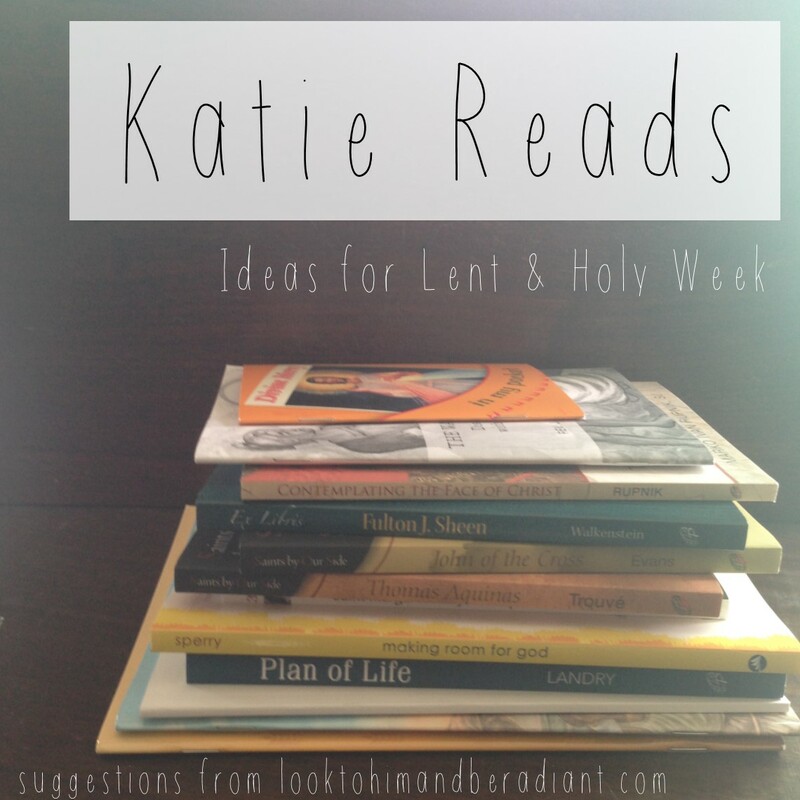 I thought you might be considering the same thing, so I've pulled together some books that will be great for the remainder of Lent, Holy Week, and take you into the rest of the Church year. They are divided into a few categories and I've got books for both kids and adults. If you order them now, you'll have them in time for the Triduum! This post contains Amazon Affiliate links. That means that if you click through and purchase something, I will receive a small commission at no cost to you. ***Pauline Books & Media provided me with a free copy of this book in exchange for an honest review. ###Author provided me with a free copy of this book in exchange for an honest review. Praying the Stations is one of my very favorite parts of Lent, and I love that we are offered such variety in the types of reflections we can pray as we follow the Way of the Cross. Gorgeous, glossy full color photos of mosaics created by the author feature striking close ups of the face of Christ during His Passion. The images are shared alongside Scripture, ancient Christian writings, reflections, prayers, and hymns. This book would be a wonderful tool for personal prayer during Lent, especially in times that you cannot be in a church or chapel to have the visual of the Stations of the Cross around you. The photos in this book each lend themselves to meditation on the emotion of Christ and His followers during His last hours. This brand new book would be a perfect companion for children, especially little ones, during Holy Week. Each Station shares a full page illustration, and a very short set of readings and prayers (each only a sentence or two) helping little ears listen and giving quiet time for reflection. The Stations contained in the book are from the "New Way of the Cross," which includes slightly different events from the traditional Stations, including the Last Supper, The Good Thief, Mary and John at the Foot of the Cross, etc. I love that the book helps tie those important stories into the Passion of Jesus and the collective memory of the children who will pray with it, but it would be good to note that it would change the way you would use the book if praying with the physical Stations in a Church. The book also contains a list of ideas for ways to use it, especially with young children, and they offer a companion journal as well. You can preview all of the resources and purchase either physical copies or digital versions (perfect to have everything ready for Holy Week!) at Gracewatch Media. "Jesus, we want to be with you, too, both now and in heaven, along with our family and friends. Help us to be like the Good Thief. Help us say sorry for our sins, and turn back to you." This little book has made my Lent. For years, I've reread Sheen's The Life of Christ during Lent and Holy Week, but this year... I haven't. I've supplemented with some other things, but this little Way of the Cross booklet has been a powerful addition to my prayer. You can read most of the text here, but I decided to finally order the booklet so it was a bit easier to carry around and pray with. Originally written by Sheen in 1932, long before his TV Show or ordination as a Bishop, I think that it contains some of his most beautiful and profound words. "Oh Lord, the day I was born anew of water and the Holy Spirit, the image of your Cross was engraved upon my heart. Today you ask me: 'Whose inscription is written thereon?' If it be yours, then let me render to God the things that are God's. Grant that, like Veronica, I may brave all human respect to carry your image about with me, not on a veil but on the tablet of my heart. Bestow on me the grace to be so much like you that others among whom I live may see something of you in me, as the maidservant saw something of you in Peter. If they do not see in me that marks of your passion, let them at least see the sparks of your love." Thanks to a Hobo for Christ Podcast Saints Stories for Kids, my students have been fascinated with St. Longinus. Tradition says that he is the soldier that pierced Christ's side, but his story doesn't end there. This black and white booklet shares the Stations of the Cross, but told from the perspective of St. Longinus as he participated in Christ's Crucifixion. It is a unique point of view, but the more you read and pray, the more you see that it could be you that is telling the story, you the one that led Christ to His Death. The reflections in this booklet are a bit longer, so it would work really well for personal reading and contemplation as well as group prayer. I liked how peppered throughout the fictional reflection of Longinus are lots of Scriptural quotes and their references, giving you even more to read and think about. "I stood at the tomb beside the Mother of Jesus. Never taking her eyes off the tomb, she reached for my hand and simply said: 'Love is stronger than death.'" 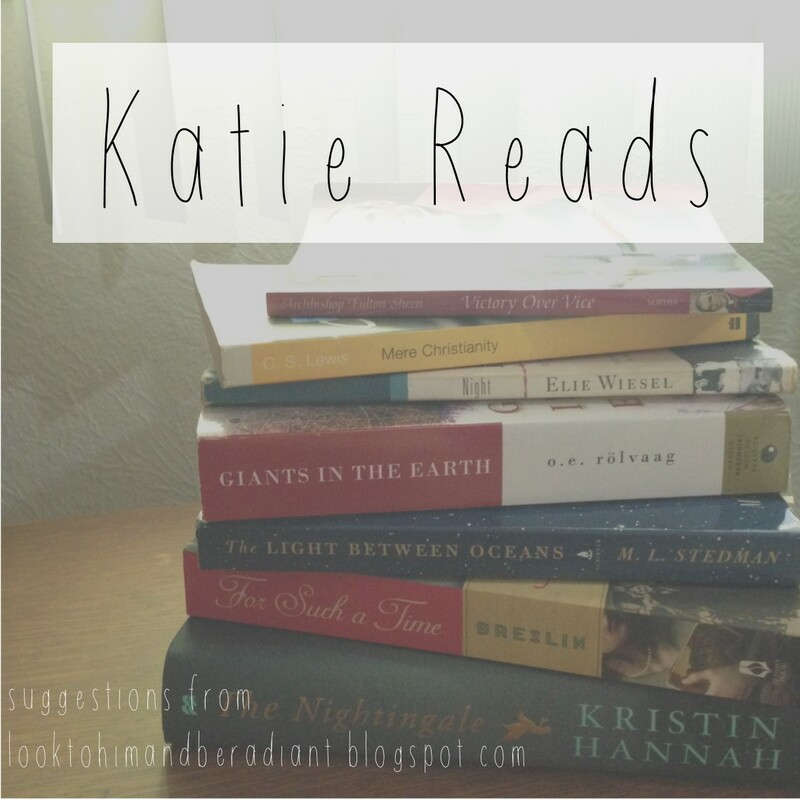 This sweet but solid book about Christ is a perfect companion to Our Blessed Mother, reviewed in my last Katie Reads post. Jesus our Savior is beautifully illustrated and filled with the story of Christ's life, from the Annunciation to Pentecost. Organized in chapters and almost sixty pages long, this brand new book fills a need for easy chapter books about the faith designed for older elementary students. As I described in my last post, many picture books are written at a lower level and have smaller snippets of information. I love that this book has more substantial information while still being illustrated and attainable. The short chapters and frequent illustrations are joined with detailed stories and longer chunks of text. I think this series would be perfect for 3rd-5th graders and am glad to add it to my classroom library. This cute little companion book is a perfect to give kids this Lent or Easter. With info about Jesus, the Image of Divine Mercy, St. Faustina, Divine Mercy Sunday, and how to pray the Divine Mercy Chaplet, I think that this little book would be great for students preparing for Confession (their first or any time) or during the quiet prayer time of the Triduum. It would also be a perfect inexpensive addition to an Easter basket to help prepare kiddos for Divine Mercy Sunday! During these last days of Lent (or throughout the Easter Season), we have a perfect time to get to know a new-to-you heavenly friend and learn from their examples. This Saints by Our Side Series is intended to help bring the stories of Saints- their lives, teachings, and impact on the world- in a short and attainable text that is still packed with content. I love the length of these books (just a little over 100 pages) which makes them easy to pick up and get to know a new Saint. Each book shares a thorough biography, a chronology, an original prayer, and reflection questions, and detailed bibliography. Neither Thomas Aquinas or John of the Cross are Saints that I previously knew a lot about, so these books were a great introduction. I'm excited to see how this collection from Pauline Books and Media grows! I (not surprisingly) was super excited for this book to arrive in my mailbox. Sheen and I are BFFs, after all. This author has pulled together some favorite, powerfully themed writings from several of Sheen's books and then organized them topically in this compact 120 page book. 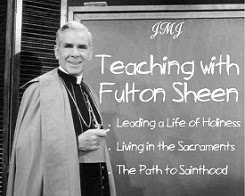 If you've never read Sheen, this would be a great place to start. With the smaller chunks of writing, you can choose a topic (in any order) and read the 2-3 page chapter. If you love it, the chapters are organized by themes, so you can read the section. And if that really speaks to you, you can find the original sources of Sheen's writings and dive into one of his full length books. If you have read Sheen, this little book is a nice companion. Sometimes he packs so much content and thought into his text that a meaningful passage can get lost in a 400 page book. Here, you won't miss the message and can reread as your heart desires. I've been carrying this book around in my purse during Lent. When I need to fill five minutes here and there I can pull it out have found it easy to pick up and put down while still gathering great spiritual fruit. Part of the already mentioned series of picture books for older Catholic kids, beginning with Jesus and Mary, this biography of St. Teresa of Calcutta is just lovely. Still organized by chapters but containing full page illustrations, this would be a great beginning biography book for 2nd or 3rd graders, or a perfect quick read for my 5th graders. I love the photographic/sketch style of the illustrations which often are from a unique perspective point and really capture the emotion of Mother Teresa's prayer and work. There are a few two page spreads with no text, moving the story along with pictures. Little details like page borders that match the sisters' saris are thoughtful and eye catching. I'm grateful for the variety this book adds to my classroom Saint book collection. Speaking of my classroom Saint book collection, the Encounter the Saints series will always be my favorite and most recommended Saint books for upper elementary kids. The compact chapter books are novelized biographies, making it easy for kids to read and relate to the Saints. Often including info about the Saints childhood also helps children imagine themselves follow in the Saints footsteps. As much as I love the Sacred Heart, I didn't know much about St. Margaret Mary or her friend St. Claude de la Colombiere, so I thoroughly enjoyed reading this short story of their lives and the devotion that they shared with the Church. Minimalism, decluttering, organizing, tiny houses, intentional buying... sound familiar? It's currently trendy to get your life organized, but this author connects that trend with spiritual truth. 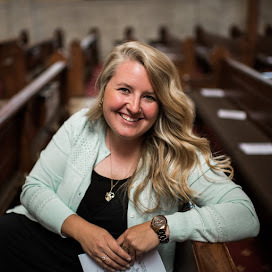 Speaking from personal experience (including struggles and triumphs) she shares tips and ideas for simplifying our physical surroundings while connecting them to our spiritual selves. Part memoir, part how-to, and part theological reflection, this book reminds us that the body and soul are both good and cannot be separated. Therefore how we create and fill our homes for the needs of our bodies is intertwined with the needs of our souls. Whether you are a pack rat or a neat freak, everyone has something to learn from this book because it's about more than the state of your created stuff; its about your soul and its relationship with the Creator. 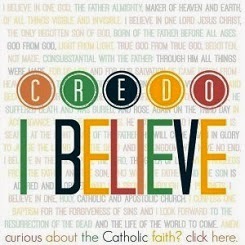 So what will you be reading during Holy Week? Do you have any old favorites or new books waiting to walk with you during this holy season?